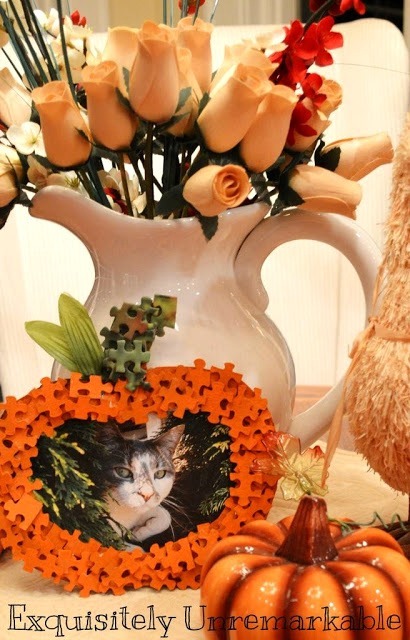 Make a puzzle piece pumpkin to usher in fall with style. It's an easy DIY craft that upcycles those old pieces. There is finally a chill in the air around here and even though fall is still technically a few days away, I am ready to jump on the seasonal bandwagon and decorate for autumn. This puzzle piece pumpkin has always been one of my favorites. It is a super easy and very inexpensive craft that can be used as part of a seasonal home décor vignette or made for or by kids as a holiday photo frame. I used to make it in my classroom when I was teaching with kids from age two to grade four. This year, since I am not teaching and do not have small children of my own, I decided to make it as a frame for a fall saying and employ it in a more sophisticated way. No matter which way you choose to display it, the directions are the same. To show you both outcomes, I put a picture of my pretty kitty in the frame, as my teens did not approve of any of the photos I wanted to use of them. Cats do not have the same veto power. I started by drawing a pumpkin shape on the cardboard from an empty cereal box. Then I cut the shape out, folded it in half and cut the middle portion out to fashion a frame. The shape does not have to be perfect. If you need a guide, a small paper plate can give you a good start. I had a some old pieces from my art cabinet, but not enough, so I grabbed a puzzle from the dollar store. The picture on the puzzle does not matter. Since I had a choice, I picked one that had some green in it, as I knew I would use those pieces for the stem of the pumpkin. It would save me some painting and add a little interest. I painted both the pieces and the frame, to provide a uniform background in case it peeked out at all. I painted the back of the puzzle pieces, not the shiny front, as it does not hold the paint as well, also it would require more than one coat to cover the printing. I used some old craft paint and a foam brush. However, when working with kids, either your own or in a classroom, I would suggest spray painting or pre-painting the pieces. It saves a lot of time and a lot of mess. Or you could embrace the mess and use orange finger paint. It makes a really sweet kids' craft, but painting the tiny pieces is a messy job and gets all over little fingers. FYI, it gets all over big fingers too! When the pieces were completely dry, I glued them around the frame, layering several pieces on top of each other, any glue is fine, just make sure it dries clear. Like I stated earlier, I had green pieces in my box, so I used them as a stem. I also added some leftover greenery as leaves. I like mixing textures and finishes, I think it adds more interest to the project. When I was happy with my creation, I coated the entire thing in decoupage gel to set it and give it a little shine. I used the drying time to print out a seasonal phrase on cardstock. I did it on my computer, no fancy tools or programs, I picked a pretty font in Word and was done in minutes! I used scotch tape to adhere it to the back of the pumpkin. When dry and complete, I leaned my puzzle pumpkin against my pitcher, but the options here are many. I could've added another piece of cardboard to the back as a stand if I wanted. If I was going to use it for a child's photo, I would add the picture and then add a piece of paper over the back to secure it, including the child's name, date and maybe even handprint. A small piece of paper on the bottom with the words "MY LITTLE PUMPKIN" could be added to enhance the frame and in the past I have tied a green ribbon at the top to make it a hanging decoration. You can even lace a few up for a seasonal banner. If you make this on a larger scale, it would be a really cute ornament for your front door or wall, wreath style. Smaller pumpkins could be made to just adorn a burlap or twig wreath or you could make acorn, gourd or black crow puzzles. The possibilities here are truly endless, limited only by your imagination! 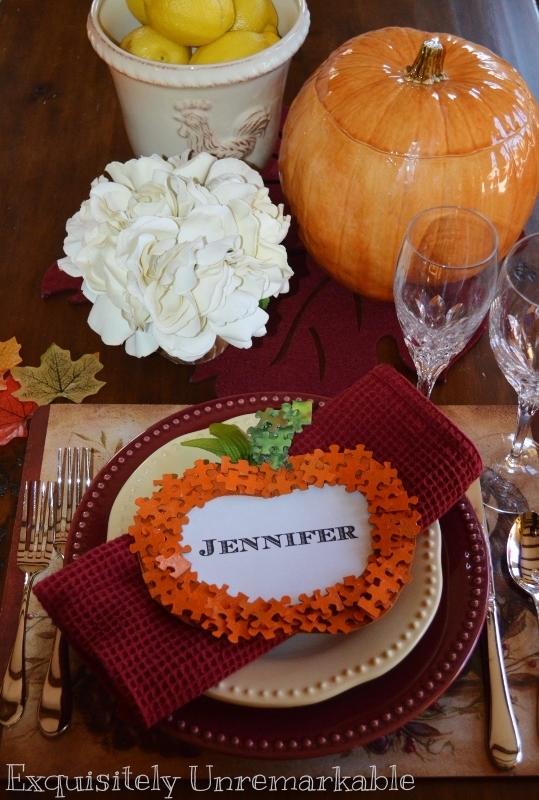 For Thanksgiving, I transformed my pumpkins into place cards, simply by adding a name. I can honestly say that making this project was so much fun and brought out the kid in me ~ hands in paint, bright colors and puzzle pieces! If you try this project I would love to hear from you and know what you thought about it and how you made it your own! 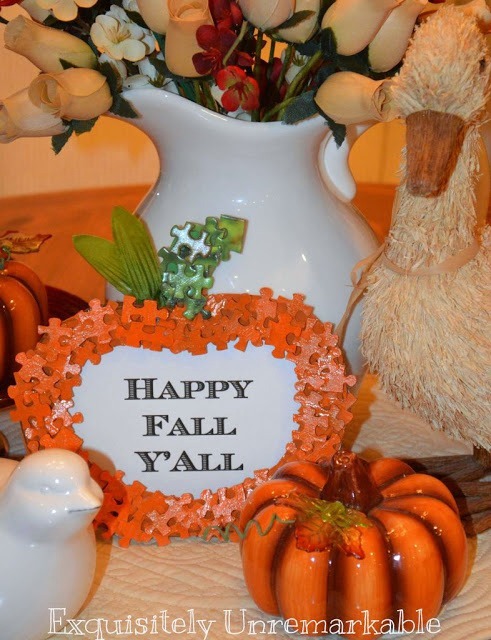 Until then, enjoy the season and like the sign says, Happy Fall Y'all! If you liked this project, check out the other ways I have used puzzle pieces! Genius Kim! There are tons of puzzles everywhere and this is a perfect way of reusing them! Thanks for the great idea! Thanks Vel. You are right! Great way to recycle your old kids' puzzles and they are dime a dozen at Goodwill for sure! This is such a cute idea! How clever of you to make a pumpkin out of puzzle pieces. I saw this on Primp Your Pumpkin and was fascinated by it! Hi Gail, I love this craft too! It was a staple in my classroom. I made wreaths for Christmas and hearts for Valentine's Day....I figured why not pumpkins for Halloween! Thanks for your kind comment! Now that is totally adorable! My boys would get a kick out of this! Thanks so much for sharing, Kim! Have a wonderful week! What a wonderful and creative idea, you are fantastic, love it. So many possibilities! Great project to do with the grandchildren or a friend! New subscriber from the post on Hometalk. EXTRA POINTS for using the old cereal box. I am forever looking for ways to reuse stuff so that it does not get thrown out. Thanks LuAnn, yes, I try to use whatever I can around here! It saves the planet and my money! :) So glad to have you along! A few years ago at a family Christmas gift exchange someone gave my husband and I a set of TK puzzles. From there it has blossomed. DH picks up puzzles at Goodwill for $1 all the time! We could have a whole church bazzar dedicated to puzzle-piece crafts! Oh! Now, there is an idea for a fun get-together. Thanks for the cool ideas! Another thought: Put the puzzle together first (I always hate taking it apart right after it's finished) and then turn it over to paint the back. Spray one color - or one solid color, then lightly spray another color over the top; paint by hand in several different colors - one per section. That would make it a lot easier to paint. Thing is, the edges would still be unpainted. But that could just add to the depth, right?? It sure couldn't hurt to try it, Nancy! You could always touch up the edges after or take it apart while the paint was drying so they didn't all get stuck together and then you just touch up. If you try it, let me know how it works out for you! That is so stinkin cute, I love it! Pinning now too. What a cute and creative way to use puzzle pieces. Love it! Thanks Babs! I had a lot of fun making it! how cute and I love the textured look. Thanks for linking to DIY Sunday Showcase. Thanks so much for taking the time to come by and check it out, Wanda! Thanks so much, Marty! I always enjoy your parties, I will certainly link up! Thanks for the invite! Your frame is so cute, clever and creative! I could see this in so many holiday themes! It is a very adaptable craft, Laura and it is so super simple to do! I hope you are enjoying the week, as well~ thanks so much for stopping by! cool idea!! Thanks for sharing it! Thanks for taking the time to comment, Shamene. Hope you come back again! SO creative! I would have never thought to do anything like this! I'm really not that creative, I've just had years of immersion in kids' crafts, Jenna! What a cute idea! This would be perfect for the kids to make too! Thanks Tammy! I'm so glad you popped by to check it out and I'm glad you liked it! It's just a reinterpretation of an old teacher craft! So easy! Really adorable! Thanks for sharing at the Creative Muster Party! Thanks Katie! I will check it out for sure! :) Glad you popped by! Kathy, I am having a fabulous weekend NOW!! Thanks so much, I am so very flattered! :) Thanks so much for the opportunity to link up each week! Very impressed with your up cycle thinking on this project!! Love It! Thanks JoAnn! It's an old favorite, modified from my teaching days! Thanks for checking it out! Happy October! super cute! puzzle frames would make awesome gifts! thanks so much for linking up at The Humble Brag last week and hope to see you back tonight! Thanks much, Jocie. Yes, they are really cute gifts...or holiday ornaments or gift tags....you get the idea! ;) Thanks for the invite...I love a party! That is a really cute idea for a pumpkin. Great idea! Found you via Pin Junkie! Oh goodness!! ADORABLE! Thanks for sharing at Throwback Thursday. What a great fall project! Thanks for sharing this at The Pin Junkie Link Party! It was featured in a collection of fall decorating ideas. http://www.thepinjunkie.com/2013/11/fall-decorating-roundup.html. Make sure to link up your fall recipes at Friday's party! Well, I don't know how I missed this cute thing, Kim! I love this, and now my mind is spinning with all kinds of ideas! Leave it to a teacher to come up with something so darn cute! I just can't get enough of the puzzle pieces Carol, they really are very versatile! Have fun! What a GREAT idea! I so have to make this. Hey Kim! Congrats on making the Huff Post 45 Fabulous (and Fast!) Ways to Decorate Your Home! You're #13! I love this type of art. I made a puzzle piece pumpkin - about 9" wide - a few yrs ago and mounted it on black felt inside of a picture frame. I love seeing it on my wall each fall. I plan to make the "love banner" from puzzle pieces for Valentine's Day. Super cute! Now I know what to do with my old puzzle pieces! Such a cute idea!! I love the the place cards!! Very creative!!! How creative! These are adorable! Great way to reuse old jigsaw puzzles. Thank you so much, Linda!! I have to say this has always been one of my favorites.